Okay, so I will admit that New Moon has only been out for like 11 days or something like that and I have already seen it three times. But in my defense, one of the times was free, so that really doesn’t count. Needless to say I totally loved it. Here are some of my favorite (and not so favorite) parts of the movie. Things will be a little spoilery from here on out. *I liked Kristen Stewart so much more in this movie!!!!! Even though she was all angsty and totally lacking in any girl power or sense of self, that is totally in keeping with the book so I could ignore that. I think I am just really annoyed by her acting when she is around Edward……so that didn’t happen very often in this movie. *Ummmmmm, Charlie is like amazing! I totally love him a little bit more each time I see the movie. *Speaking of non-monster characters…….how about them humans??? Mike and Jessica stole every scene they were in! 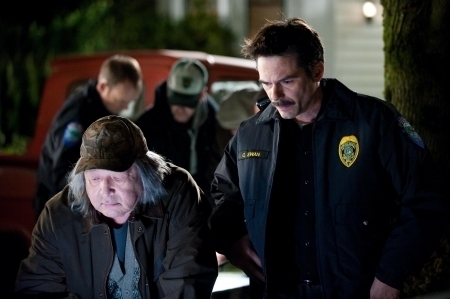 Mike was fantastic in the movie scene (man, can that boy play sick!) and Jessica can take a line like “movie night with Bella” and make it the funniest thing ever. *I am not going to talk too much about how awesome the shirtless werewolves are because it’s kind of creepy. I’ll just say that Paul was really hot because he is 24 so that makes it a little more okay. And Jacob was awesome. That is all. *Michael Sheen as Aro was the greatest casting in the history of all movies. I love the fact that he is this super important well respected actor who has been in Oscar winning movies and yet he is not afraid to do stuff like New Moon for fun. He played Aro pitch-perfectly. No one else could have done it better! *I adore Alice…….I also adore Alice and Jacob interacting……….I have such high hopes for the vampire/werewolf interactions in the next movie!! *I thought they did a MUCH better job of doing the vampire running thing in this movie. Now on to the things I did not like so much. *Ummmmm, this is not a high school play……so could you at least get some decent wigs. Jasper looked hideous….there is no other word for it. People literally laughed every time he came on screen (and that was before he even started speaking). Also, Rosalie’s hair was TERRIBLE!!! I know that she has brown hair in real life, but really…….SNL has better wigs than that. *Too much lipstick on Edward!!!!! Also, he looked like an undertaker in that suit. *I HATED what they did with “The Phone Call.” In the book, Jacob doesn’t know that it is Edward on the phone and innocently answers “Carlisle’s” question when he asks where Charlie is. In the movie, Jacob knows it is Edward on the phone and obviously phrases his response to make him think Bella is dead. Yeah, Jacob hates Edward, but it really pisses me off that they made it a deliberate action on his part. It is literally all his fault that Edward almost dies. I’m kind of mad at Taylor for this one because he’s been talking so much about how he really studied the books, and anybody who has looked at Jacob’s character closely would have caught that and fixed it. All in all, I thought it was a great adaptation of the book. One of the things I really don’t like about the movie being so popular is that is brings out all the haters. For some reason, people just cannot leave the movie alone. Everytime I read an article online about the movie, all the comments are filled with vicious and hateful people just ripping Twilight to pieces. I understand it is not for everyone, but please…..leave my guilty pleasure alone! Amber’s Bridal blah blah blog: BINGO! So there I was, feeling all “AAAAAACK!” I love love love weddings and cheesy things and girly things, so why was I being all Bella Swan about planning my wedding? "Eh, I'm Bella and I like Wuthering Heights and I'm too good for prom and dresses. frown." Then one day, it suddenly all became clear. Bingo. Bingo! I wanted to play Bingo at my wedding reception! How I want to look on my wedding day. I spent a couple days just feeling all giddy and dreaming of Bingo before it gradually became clear why I wanted Bingo. My grandmother was a big Bingo player, and thus Bingo is closely tied to memories of my family: we played Bingo together every Thanksgiving using bowls of corn kernels to mark our cards; Grandma would always give us a few quarters to play games with her at the summer festivals of Long Grove, McCausland and Donahue; and I spent HOURS making pictures using her Dotter markers. Bingo means family, bingo means sharing, and bingo means fun 🙂 === MY WEDDING! :::sigh of relief::: everything makes sense now–I want my wedding to feel like a good ol’ family get together! food off the grill, Bingo and horseshoes, uncles watching football, grandmas playing cards, etc etc. Wheeee I am so excited now! Every bride needs a bingo moment. Let the planning begin. Let me just start by explaining what has happened to me tonight since I got home from work. 1. Have been dying for a pizza hut pizza, so tried to send my order in online three times (I have an online only coupon that I want to use). It never worked. Finally gave in and called the place for a delivery. Wait time was an hour and a half….so no pizza for me. 2. Needed to do laundry. Laundry card (like an ATM card) only comes up with an error message. Tried it on another machine and it says I need to “see the manager.” So no laundry either. 3. Decide to make banana bread. Proceed to drop half of first banana on the floor. 4. Smoke alarm goes off while cooking dinner. 5. Carbon Monoxide detector is now going off. And we all know that is not something to take lightly in my apartment of doom. Maintanence is on the way. I was in a pretty foul mood…..until I saw my friend Abby’s twitter update that linked to this article about Bella the dog and Tarra the elephant. It is so fantastic that the video had me crying before it was even half over (crying in a good way). So everyone go and read the article and hopefully it will give your day a boost as well. It is hard to ignore all of the kerfluffle fans are having about the fourth book in the Twilight Saga. I am actually getting pretty sick of hearing about it myself. I had some issues with the second and third books, so I was fully prepared to despise this one, but come on people, it is AWESOME!!!! For those of you who haven’t finished it yet, please stop reading now, but for everyone else, get ready to hear why I love it……. 1. Bella rocks!!!! I have spent a lot of time recently complaining about how much I hate Bella. Now I know why she was such a wimpy human character………she was born to be a vampire! I love how she is now the most intimidating member of the Cullen family. Way to go girl! 2. Charlie was allowed to stay part of Bella’s family. 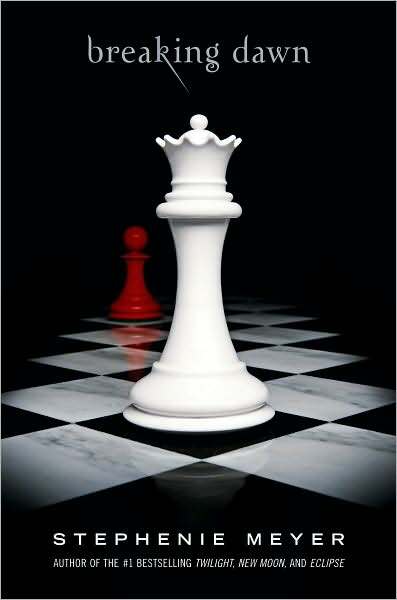 This was the thing that I was most worried about, the main reason that I did not want Bella to turn into a vampire…so when Ms. Meyer came up with a way to solve this problem I knew I was going to love this book. And of course, it was Jacob who came up with the ingenious solution, because Bella and Edward were too wrapped up in each other to realize how simple the answer was. 4. The action revolved around so many different characters instead of just Bella and Edward. I loved all of the interactions with the Cullens and the werewolves and also the introduction of so many new vampires (Garrett anyone??). 5. Jacob got his own section!!! How can you not love this guy with all of those amusing chapter headings. 6. Jacob ended up happy. I was worried that in order for Edward and Bella to be truly happy together, Jacob would have to be eliminated, but thank goodness that was not the case. Even though it was a little icky at first, I loved the idea of Jacob and Nessie. Now they can all be a happy family together!! 7. The relationship between Jacob and Edward was classic. I love that these two finally became friends. When Edward called Jacob “my son” at the end, that was when I really sobbed. 8. No big fight at the end. I am so sick of the big end-of-the-world battle to end a series. I really am a pacifist and was happy that no one died (except of course that one chick, but I didn’t really care). 9. The bed frame and the pillows………ah wonderful. All in all a very enjoyable book that has given me a whole new appreciation of the entire series. After seeing Stephenie Meyer in Chicago at the Breaking Dawn Concert Series, I know that she is a kind, funny, adorable woman who doesn’t deserve all of this flack just because some people are upset Jacob didn’t die. I don’t like this new format the blog is in – it just took me about 5 minutes to figure out how to be able to write in this little box thingy. Anyhow, just two things I was thinking about this weekend…nothing big in particular. First: Yesterday I was in Cedar Rapids to see my sister run in a track meet and to play disc golf (I am terrible) with HWSNBNITB and his 2 friends. After the track meet and disc golf, we had dinner at Sushi House (I had no fish, do not worry readers) and then went to HyVee so that everyone could pick up their choice of beverage (mine was hot chocolate – I even got a can of whipped cream, mmmmm….) before we went and watched a movie. When we were in the parking lot of HyVee I realized it smelled awesome outside. I originally thought it was HyVee, but then to my pleasant surprise, I realized that I was in CRapids on Crunchberry Day. I have been waiting for the day that I drive through CRapids and it did not smell like Cheerois (not as good a smell as you might think). Well, yesterday I fulfilled that dream. I encourage all of you, dear readers, to aspire to be in CRapids on a Crunchberry Day. You will thank me. The second thing I was thinking about this weekend (OK, I’ve been about this for quite a while now, but I hadn’t made my decision until today), I am ready to declare myself officially on a team. For the longest time I have been toward between Team Jacob and Team Edward. I know Jen resides on Team Jacob and I fully respect her for that. 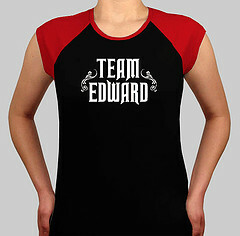 But as of today I am officially and irreversably on Team Edward. Why? I realized that if I was on Team Jacob, I would have to support the fact that Bella and Jacob would eventually get married, making Bella Swan legally Bella Black. RED FLAGS READERS!!!! RED FLAGS! Does this mean anything to you, because it should. I know that she would be Isabella Black, but no one would ever call her that. She’d be Bella Black and we all know it. I think I would have to hate her if that happened. Not because of anything she’d done (except ditch Edward) would I hate her, but I would have to because of the common name. I’m sorry, but I just cannot support a Bella Black in any series thanks to JKR. Stephenie Meyer – you had me fooled a little bit. You had me believing that Bella Black was actually a possibility, but when I finally made the connection I realized that it was never really a possibility, not when Bella Black is such an evil evil evil witch. I can already see the fanfic!! Isabella Black gets hit over the head, has amnesia, is told her name is Bellatrix and is adopted by the Black family of England. It’s just so wrong. Well, that’s all for now. It’s 10:30 on a Saturday night and I am just too tired to stay up any later. I’m elderly.